Do you have Harry Potter fans in the house? We went through a couple of years when the kids were really really into it, and we read all the books together, then they read them alone. After we visited Universal Orlando this summer, we are all totally back into it–especially my husband and I! Just walking around in the Wizarding World of Harry Potter brings back the magic and makes you feel like you’re inside the books. 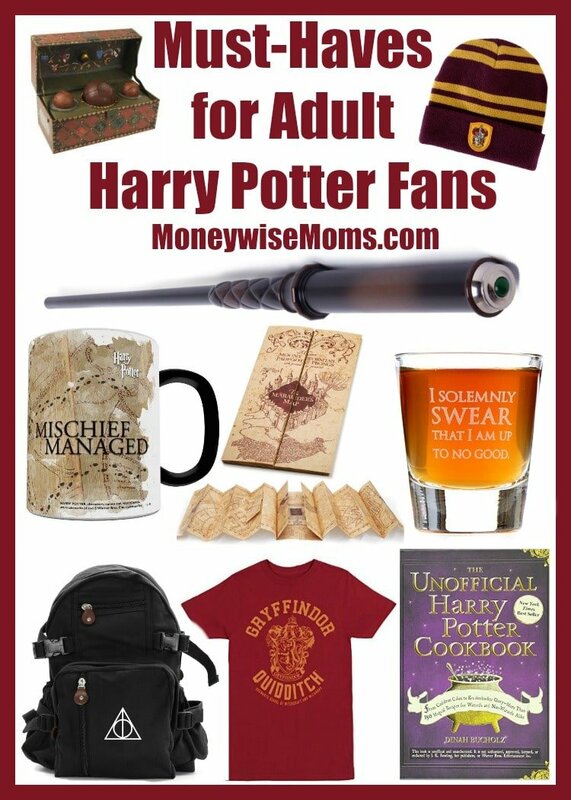 Whether you’re shopping for birthdays or the holidays, this list is perfect for all the Adult Harry Potter Fans you know, but they’ll work for teens and tweens as well! Don’t forget, you can also grab Harry Potter – Complete 8-Film Collection as well! Think ahead for your holiday shopping–now is the time to sign up for an Amazon Prime 30-Day Free Trial . You’ll get free 2-day shipping, unlimited streaming of thousands of movies and music, free eBooks, and more! You will love how much easier it is to shop this way during these super-busy months. It’s the best way to shop for fall birthday, holiday gifts, and more. Plus, I can use the FREE Amazon gift cards that I earn from Swagbucks. That’s my favorite way to shop at Amazon!